3. Subscribe to "Makeup And Beauty Videos" by email (must verify 1- entry). You can find this link at the top side on my website. These requirements are mandatory to win! 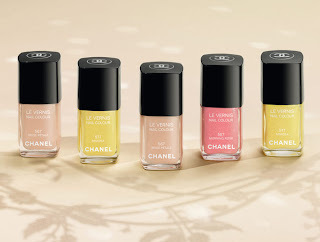 There will be 1 lucky winner who will win the 2011 chanel summer nail collection (3 colors in all) and 10 winners that will win 5 free "Chanel samples each. All winners will be randomly picked so it's anybody's game! The winners will have 48 hours to reply to contact email or a new winner will be choosen. So girls, what are you waiting for! This is a must have collection, be the first to get it! Good luck and have fun! My favorite color in this whole collection is definitely "Mimosa"! It's exactly like the drink, Yellow and shimmery! My favorite color is Mimosa, because it reminds me of the Mimosa tree I had at my parents' house when I was a child, and it was all yellow & shiny at spring and summer, this color made me happy! Such a perfect color for a tree! Is it still there when you visit? my favorite color is Mimosa because it reminds me so much of summer and gets me excited and happy. Its so bright and neon (: Also I can't find your twitter.. but I did retweet your giveaway would you please post your twitter link to follow you? You've got great taste in nail colors! Hope you win. My twitter button is right above my google connect link. Thanks and good luck! My favorite color is Mimosa, hands down, because it's the perfect spring color that will go with any color of your clothing. I love Beige Petale. So prety and sweet like a soft rose. Follow you on Twitter as @monikaretnani & tweet about this giveaway here. Subscribe to "Makeup And Beauty Videos" by email. Hi, i'm in love with Chanel Morning Rose, such a pretty & delicate shade perfect for summer, love it!! I have to agree with you, Chanel's Morning Rose is like a delicate flower... super FAB for summer! I really like Beige Petale. It's such a romantic nail color. The other colors are nice bright colors for summer but I feel Beige Petale has a nice subtlety to it. Following via GFC as Kannica and suscribed via Google Reader. Yes Morning Rose is pretty! My favorite is the morning rose. The color is just the right shade and the name fits it perfectly! Morning Rose seems to be the favorite so far, I think I'm in love with all 3 colors although "Mimosa" has me blind! Can't wait to do a video on what these colors actually look like on! I'm following, and following twitter and twitted you and I'm subscribed... I think I might mention your blog in one of my posts too - I LOVE IT SO MUCH. All these colours are beautiful, but with such grey skies in London, I think a flash of Mimosa on a girls nails will cheer her up and everyone who sees her. 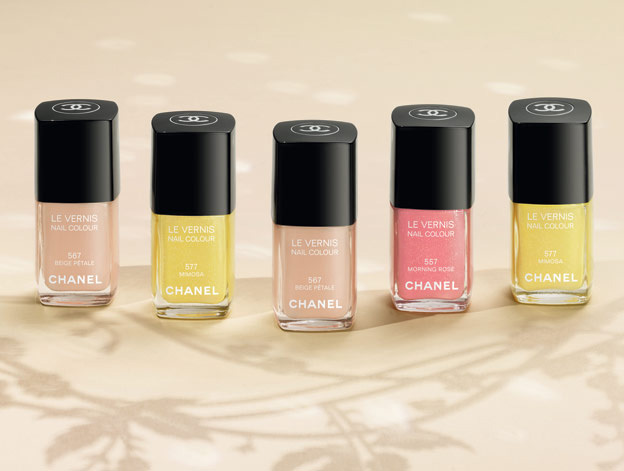 It is daring but cute and it is different from any other chanel colour. Stunning. Thanks for following! Sorry so gloomy in London, still would love to be there heard it's very exciting! "Mimosa" is exactly as you stated, sunny and cheery just like Florida is today! I am so excited about this color, be sure to check back for a video on what it looks like on to be posted very, very soon! Love your site too, thanks for the love!